The Flipper bird feeder features four feeding ports that are easily accessible via the perch ring. The feeder also comes with a unique mechanism that deters squirrels from accessing the bird seed. Birds will not set it off, not even larger species like Woodpeckers and Cardinals, but the minute a squirrel hops onto the perch, the motor is triggered and the feeder begins spinning, taking the squirrel for a whirl before it loses its grip and is thrown gently from the perch. The Flipper caters to a vast array of beautiful birds. Birds that use the feeder include Cardinals, Chickadees, Finches, Flickers, Goldfinches, Grackles, Grosbeaks, Jays, Juncos, Kinglets, Nuthatches, Redpolls, Siskins, Sparrows, Starlings, Titmice, Towhees, Woodpeckers, and Wrens. Equipped with microban antimicrobial technology, the Flipper bird feeder helps fight the growth of damaging bacteria, mold, and mildew, which means healthier birds and high-quality performance from the feeder, year after year. The Flipper's clear feeder tube makes the seed visible to birds, a proven advantage. The feeder tube is made of UV-stabilized polycarbonate, which ensures long-lasting durability without yellowing. For added convenience, the generous height of the feeder makes it impossible for squirrels to hang down from the top to reach the feeding ports, and the feeder's heavy metal cap fits snugly on the tube to prevent squirrels from lifting it to reach the seed inside. Hang the Flipper securely from its heavy-duty signature-looped stainless-steel wire, which helps to reduce motion that would otherwise spill seed. With a large 5-pound capacity, the bird feeder doesn't need to be refilled every day, and be rest assured that the seeds are flowing freely to all four ports (thanks to the feeder's internal baffle system). The metal top and base of the Flipper are powder coated in Forest Green for a complementary addition to any yard or garden. 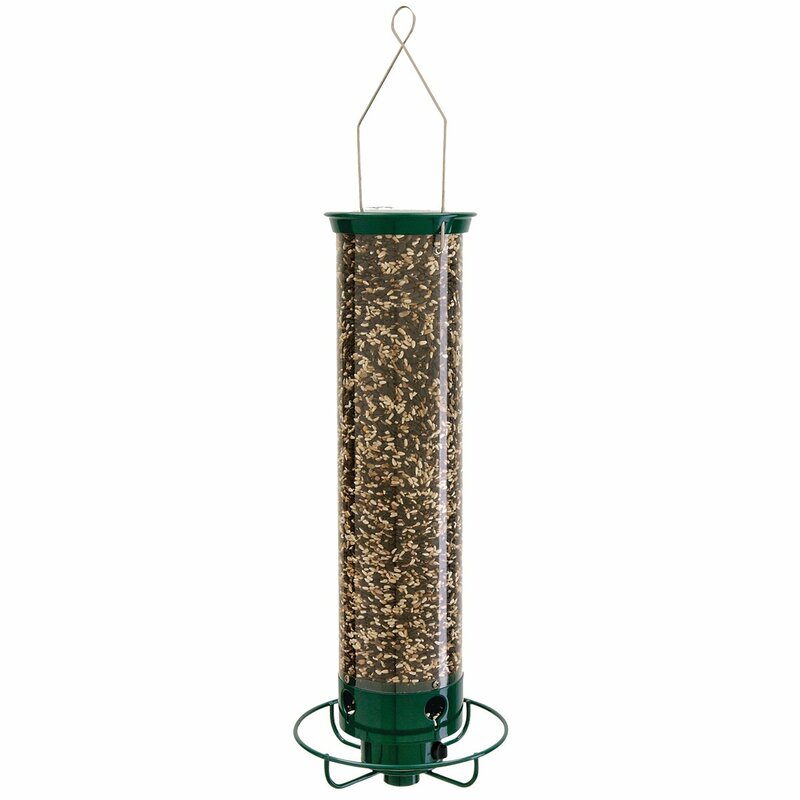 With components made in the USA and China, the Flipper carries a lifetime manufacturer's warranty against squirrel damage to the feeder and a one-year limited warranty on the electronics. • The feeder came completely set up; there was no assembly required. • Comes with it's own rechargeable battery and recharge cable. The perch that the birds sit on will not deflect with the weight of a bird; even larger birds do not trip the mechanism. But when excessive weight is on the perch it will tilt down, turn on the motor, and makes the perch turn. When the weight is removed from the perch the the motor will then deactivate. You can also disable it from turning by tightening two screws. The ports that the birds take seeds from are well designed and the birds can eat to the last seed without any problem. Return to the Category "In the Yard"